Early the other morning, my husband stuck his head out the door to survey the rain, and noticed a snake on the porch. He alerted me and I ran for the camera. Mystery snake on a rainy morning. The snake did not stay still for many pictures before it dove into the brush. The few pictures I got didn’t turn out that great since it was still dark out, but they was good enough that I made a preliminary identification of Eastern Yellow-bellied Racer. We have had a juvenile of that species here before. But as I looked closer, the gray and yellow areas on the snake’s head didn’t quite match the racer pictures in the book. 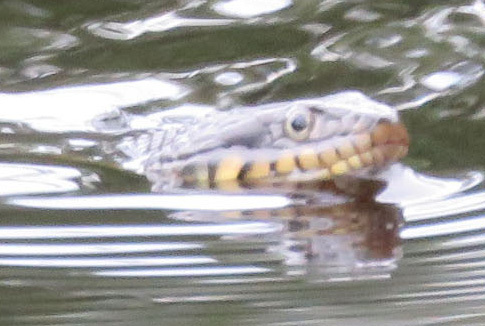 And the dark vertical lines below the snake’s mouth are like those in the Broad-banded Watersnakes I see all the time. I took this in June. I could see it wasn’t a Broad-banded Watersnake, but I couldn’t see enough detail to settle on an ID. I realized I have seen this snake around before, once on the sidewalk, thinking about coming in to the open door of the kitchen, and once or twice just around the pond’s edge. And this summer, one day I saw a snake swimming across the pond, ran out to look, but lost it once it got to the plants at the pond’s edge. Suddenly I heard some loud frog squeaks, which I don’t usually hear during the day; then two strangled-sounding ones, and then silence. So I guessed that the snake had caught a frog. 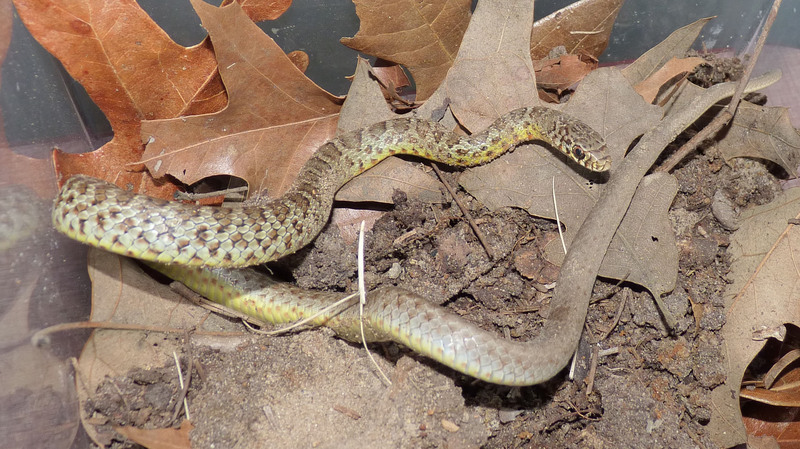 A few weeks later when I heard the same squeaks, I ran outside, and this time I was able to locate the frog in the weeds, and it was indeed caught in a snake’s mouth. It was a pretty small snake and a medium-sized frog – I don’t know if the snake let go or the frog kicked hard, but it did get away. So with all those sightings where I couldn’t get pictures, I am glad to put all those clues together into one ID of Yellow-bellied Watersnake, Nerodia erythrogaster flavigaster. 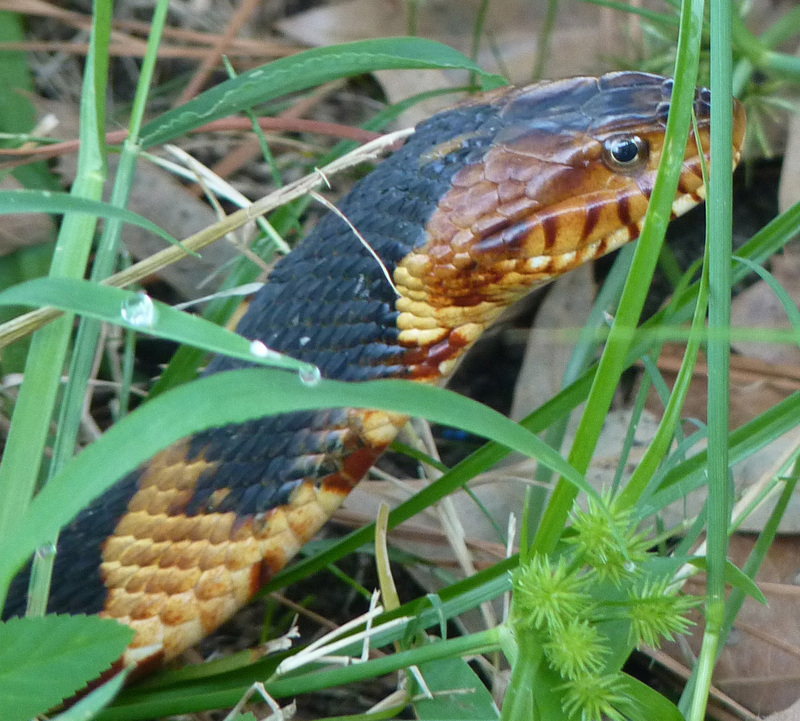 This is our tenth snake species! Herps of Texas tells me that this is one of two subspecies of Plain-bellied Watersnake. Before I moved here, I don’t think I had ever even seen a snake swimming – now I recognize that different species even swim differently. I’m having a little trouble sharing your enthusiasm about this! I don’t have issues with spiders or bees or whatever. But snakes . . . i don’t like snakes. Luckily we have very few in upstate New York! Oh, I agree! And I’ve absolutely given up on lace–it’s so overwhelming. I’d like you to write the definitive reference book on it–okay? I’ve even given up on trying to READ the definitive books on it! The authors find differences where I don’t see any. One day I am going to sit down with those books, and make each sample (in macrame size yarns) so I can learn to recognize what they are talking about. I usually only see them swimming one day a year. But once my husband and son-in-law were practicing scuba diving in the pond, and of all days, that day a snake started swimming around them. My daughter and I tried everything to get their attention, just so they wouldn’t be startled, but it took a lot of jumping and yelling to catch their eyes. Water snakes have a reputation for being sort of mean, but the ones around here have always been calm. I have almost stepped on them a few times and they just look at me. I’m so glad I saw the link to this post. Now I know that there are two species of the plain-bellied watersnake. I think this might have been the species I saw at the Brazoria Wildlife Refuge, attempting to catch a little snack. I’ve found them curled up on land several times now, and they are pretty placid. I was thrilled just to see one in the water, doing its thing.